Rational Reporting for Development Intelligence (RRDI) is a very complicated name for what is essentially a reporting engine for the CLM warehouse. Looking at the entire solution at first glance can be quite intimidating especially if one has not been exposed to warehouse concepts before. In this blog I will cover the CLM warehouse in preparation for subsequent blogs about RRDI, the schemas and reporting. So, I will cover warehousing concepts and general operation of the CLM warehouse first in preparation for creating a report in RRDI in the next blog. Lets start with a very simple scenario: I have a database and I want to report off of it. In our case, the database is one of the CLM applications, lets say CCM. What are the possibilities? Previous to the release of 3.0, using BIRT was one, and it still is, though now it is being succeeded by RRDI which is probably the better choice. a) Much of the extensibility of the Jazz products comes from the fact that XML is used as the underlying technology. So, in many cases, the operational data store of CCM, for example, has a lot of XML data in it that is hard to work with in a report writer. b) Performance. Usually you don't want to have an intensive reports running against a live repository serving operational requests (or an OLTP, online transaction processing database). c) Trending. Sometimes you want to collect data for reporting on later. d) Reporting directly from the OLTP is not supported, probably for the three reasons above ( and perhaps others ). The way to get around these issues is to create another database from which to report from that has a schema that is friendly to reporting. This is a good point to introduce the CLM warehouse component which is a separate database for reporting that you create during CLM setup. Let's look at the setup. This is basically database configuration parameters. The last user, RPTUSER, is a database user which is used by RDDI to log in to the database when executing a report. 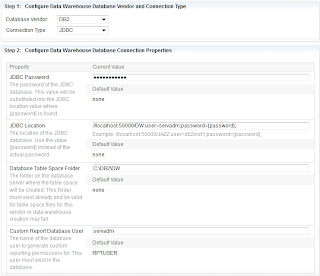 The user specified here is the user that is used by the process that transfers data from CCM (or other CLM product) into the new database we created above, the data warehouse. The process uses these user credentials to log into CCM to extract the data, so it is governed by this user's access rights. So in our scenario, now we have two databases: CCM and the data warehouse (and also a process, called an Extract, Transfer and Load (ETL) process)and we know that the CCM database is a proprietary database and the data warehouse is a report friendly database. What makes a database report friendly? Its, all in the schema. There are two primary schemas in the CLM warehouse: a normalized form (NF) schema (or operational data store) and a star schema or dimensional model. I won't go into too much detail about these topic as there are several good books about the topic but i will cover them briefly here. In the case where are tables in a database are 3NF then the database is considered 3NF. In other words, given a set of 1 to x dimensions, we will get will 1..n facts. The great thing about the dimensional form is that it is quite a familiar concept. If we happen only to specify a subset of all available dimensions then facts can be "rolled up" or summarized using a function. Functions can be average, summations, maximum, minimum, etc. You could also model another star that would give the answer to this function without rolling up. Dimensional modeling provides a easy and familiar concepts to calculate values efficiently using simple queries. Providing these types of activity in a report would be quite inefficient as you would need to calculate these values using inefficient and sometimes complicated queries with many joins. This is why this paradigm is popular in data warehouses. The CLM Data warehouse contains both the normalized form (RIODS schema) and also contains a star schema (RIDW schema). The star schema is populated from the normalized schema using a another ETL process that performs all the required calculations and roll ups. When to use normalized vs. dimensional really depends on the report you wish to create. Generally speaking, if your report is about facts (numbers) you should use a star schema as it has data already calculated with minimal table joins and is much more efficient. If it is a list of objects of some sort then the normalized form. Documentation about these CLM warehouse schemas can be found here. 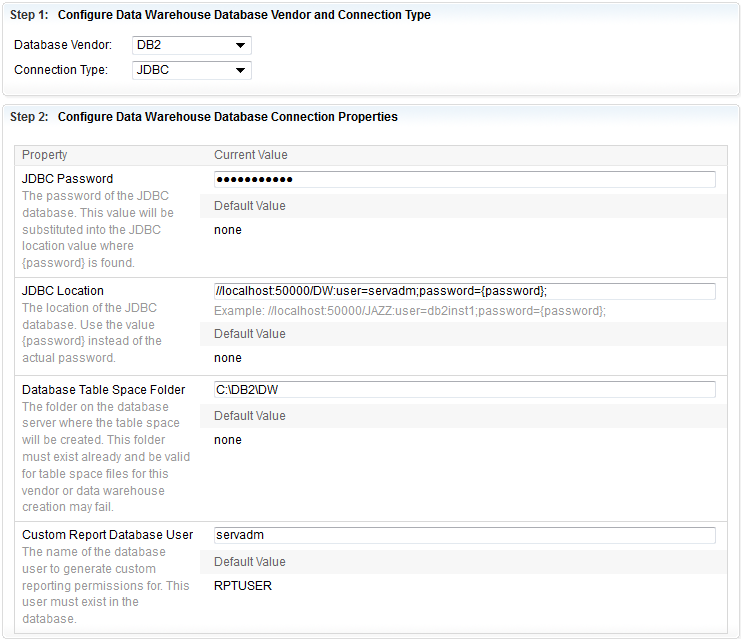 Note that "Data Warehouse" is selected. The other setting is for the previous "Data Mart" that was used in previous versions. Also Note the four ETL process. You generally run all of them if you want all the CCM data to show up in reports but you can also define better fidelity if you only want work items to be transferred, for example. You can also run all the jobs for all the CLM applications on a scheduled basis from the report section in JTS admin. From here, there is also the job that transfers the data from the normalized form (RIODS) to the star schema (RIDW). In the next blog we will use RRDI to examine these schemas from the report designer and create a report! Fantastic overview of the CLM reporting options and mechanisms. I appreciate the overview of the concepts behing RRDI and the data warehouse.